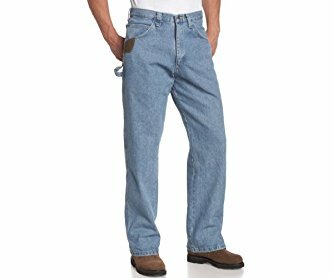 It's easy to move and easy to work wearing these relaxed fit carpenter jeans from Riggs Workwear by Wrangler. The denim jeans feature 13" deep front pockets. Patented leather tape measure reinforcement on right front pocket. Cordura a durable abrasion and tear resistant material lines the back pockets. Back pockets are reinforced at stress areas. Oversized watch pocket. Jeans sit comfortably at natural waist. Brass zipper fly and button waist. Reinforced stitching. The Riggs Workwear label is displayed on back left pocket. Imported.